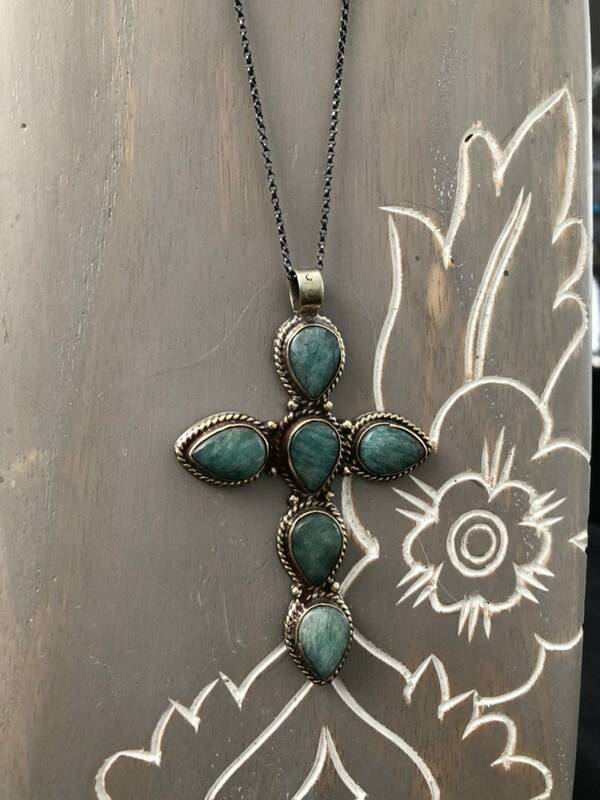 Large amazonite gemstone & silver cross pendant on a long oxidized sterling silver chain. Matte amazonite gemstone wire wrapped detail. Pendant measures approximately 2” x 1.5”. One of a kind & ready to ship! Passed my expectation. Loved it! Love the key chain I had made for my husband for Christmas. It moved him to tears! For custom or personalized orders, all sales are FINAL - no refunds or exchanges. If a mistake has been made, please contact me and I will be happy to send a replacement at no cost to you. Please contact me immediately if this is the case. This includes necklaces, bracelets, and earrings that are custom ordered to a particular size or length. Should you have any issues with your purchase, please contact me immediately upon receiving your order. I want you to be 100% happy with your purchase. Please enter the requested information in the "notes to seller" section at checkout. Be sure to enter the text exactly how you want it to read and if you would like it to be centered or right/left justified. 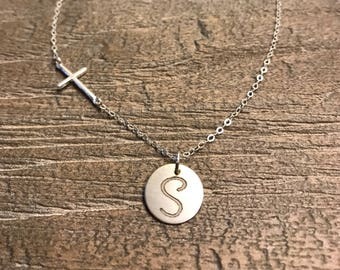 For handwriting engraving, you can upload a clear well focused image of the handwriting using the "upload attachment" button or the camera icon through ETSY conversations. You can also click on the "contact seller" button to open a conversation. If you are ordering a monogram, the traditional monogram is first initial, last initial, middle initial. Please contact me with any questions, I am here to help. You can wear your jewelry daily and never take it off! The best way to keep your jewelry sparkling is to clean it with warm water and mild dish soap or using a gentle jewelry polishing cloth. I would recommend not to use "dip" cleaners which are sometimes very strong and can damage your jewelry & gifts. If you do not plan on wearing your silver jewelry for long periods of time, it is ideal to store in a zip top bag or air tight container. Stainless steel products just need to be cleaned with a soft microfiber cloth. All orders come in a gift box ready to be gifted. If your order contains more than one piece, I will use the same box to reduce waste. If you need each piece in a box, please message me or leave instructions in the "message to seller" at checkout. How long will my pieces last? 14k gold-filled jewelry is excellent quality. It looks the same as solid gold and is great for people with allergies and sensitive skin. Gold filled has an actual layer of gold pressure bonded to another metal. It is not the same as gold plated. Gold fill has 100% more gold than gold plating. It is much more valuable and tarnish resistant. It does not rub or flake off or turn colors. I only use 925 Sterling or Argentium silver or 14k gold fill for my jewelry pieces. I custom cut the materials, file & polish each one in my studio. All my jewelry is hand crafted with great care. My keychains are made using stainless steel, aluminum, or brass and given a brushed finish prior to laser engraving. All of my pieces are custom made to order. Most pieces require 2-5 business days to create. 14k solid gold pieces may require 10-14 days for production. All jewelry are mailed USPS Priority Mail within the US and takes 2-3 days for shipping. Shipping can be upgraded to Express or Express International. 14k gold pieces will require signature confirmation to ensure they are properly delivered. ETSY will show tracking information. If your order shows "delivered" but you have not received it, please reach out to your local postal service for more assistance and to file a claim. Once the package leaves my hands and is with the postal service, I am no longer responsible for the package.